I love my bike. No, really. It's mine and I worked hard for it. I've taken the trouble to tweak it and fiddle with it and generally make it mine rather than just another mass produced machine. And I'm almost certain that you feel the same about yours. Because bikes aren't like cars. The relationship between a bike and its owner is far more personal than most car drivers. We bond with our bikes in a way that non riders just can't understand. Perhaps it's because we're so reliant on our bikes not letting us down, maybe it's because the bike working with us is so critical when something untoward happens and you need your machine to behave exactly as you expect and do exactly as you tell it. Or maybe it's just because our bikes talk to us about what's going on in a way that very few cars can. Whatever it is, why it's there, the feeling of true ownership that a biker has with his or her machine is something truly special. And that's why most people reading this will be able to understand how sick I felt, how personally assaulted, when I came back to my last, much loved, GSX-R to find an empty space where it had previously been parked. It wasn't the inconvenience. It wasn't the inevitable hike in insurance premium or the protracted haggling with loss adjusters to try to get an offer vaguely close to what the bike was worth (and I mean market value, not what it was worth to me personally). It wasn't even the "Hey-ho, it happens, here's a crime number" attitude of the Police. It was the fact that someone had taken something intensely personal of mine and was most likely going to break it into pieces and sell it for a huge profit. Well anything would be a huge profit because it didn't cost them in the first place. At that time I decided that I wasn't going to let that happen again. Locks are all well and good, but a lock good enough to really slow someone down if they want your bike isn't especially portable. Particularly as, if you want to stop a couple of burly kleptomaniac neanderthals from just picking it up and putting it in the back of a van then you need something really heavy like, say, the ground on the other end of the chain. Alarms are great, and a well integrated alarm and immobiliser, especially if it's a factory fit, will make things difficult because the thief will have to replace the entire ECU to get it working again. That's expensive and offers the opportunity for a savvy dealer to smell a rat and raise the alarm. But it still doesn't stop the thieving scumbags from stealing for parts. After all, when did you last see anyone pay attention to a bike, car or even house alarm? Quite. Then I got an email from a company called Road Angel. You may have heard of them - their best known for a particularly neat road safety system that alerts a driver, using GPS, when they are approaching an area identified as an accident blackspot and thus blessed with a speed camera, so that they can check their speed and stay safe. Ahem. 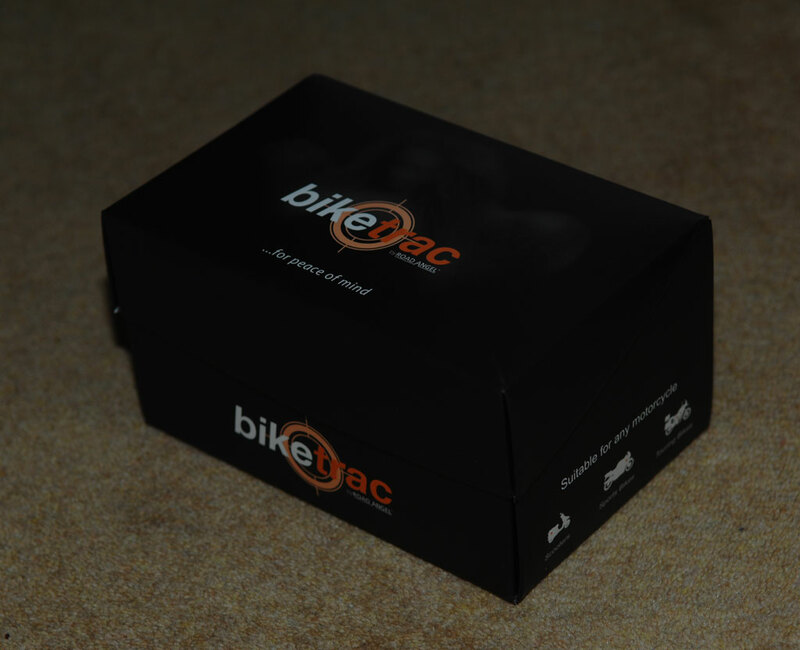 Anyway, they've launched a product called Bike Trac, as you may be able to tell from the logo at the top of the page. And it does exactly what it says on the tin, except the spelling is better. To put it very simply, the system will track your bike using a combination of GPS (satellite) and GSM (mobile phone) data. You can set it so that if the bike goes outside a certain area then it will trigger the alarm or you can run it on the more usual movement alarm. Either way, when the alarm is triggered it send you a text message and/or e-mail telling you about it. And you can log onto the system from any computer anywhere in the world and track your bike in real time, which means that you can call the strong arm of the law down on the scumbags and make it an easy collar for them. Or I guess you could get a bunch of mates with baseball bats and go retrieve your bike, though obviously that's not what we would recommend and it could end up with you getting into trouble. Because Bike Trac uses both mobile phone and satellite signals, it's harder to jam than a conventional satellite only tracker. 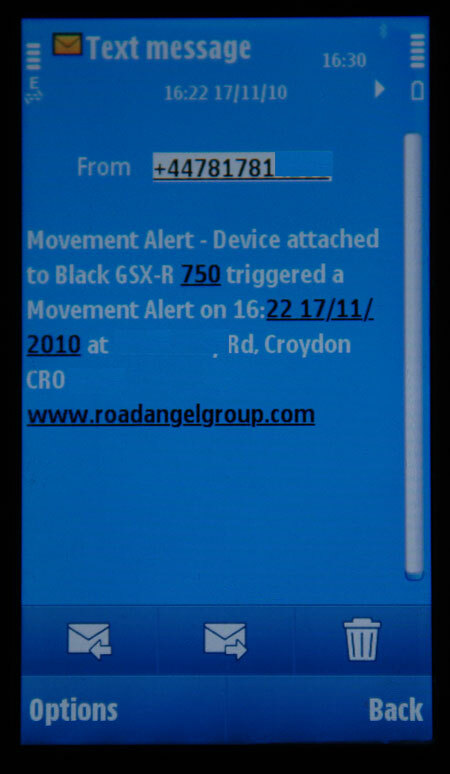 And because the tracker unit looks exactly like any other electronic module on a modern motorbike, and because it can be located pretty much anywhere, the thieving toerags are going to have the devil's own job figuring out if there's a tracker fitted and if so, where. And that's great, because it means they'll have to waste time and potentially reduce their profit margin by ditching any suspect looking electronic components. So while we all understand that if someone really wants to nick your bike then they're going to, we can make the prospect as unattractive as possible so that they find a more profitable occupation. Maybe landmine clearance - lots of money to be made, lots of adrenaline and you get to be admired and respected instead of despised and hated. That's the theory. Road Angel sent me an evaluation unit which arrived exactly as it would for a regular customer. A rather nice black box with the unit, a wiring harness and a mains charger to give it some oomph before installation. Apparently being fully charged when it's fitted means that the Bike Trac will find the satellite and phone network quicker. To test it out, I booked a fitter to come and install the unit. Though it's very straightforward - just three wires - getting Bike Trac fitted professionally means that it's more likely to look like a standard part, it'll be properly commissioned and registered before the fitter leaves and, perhaps most important of all, you'll have no idea where the unit is. Which means you can't tell anyone, even under duress. Logging onto the website allows you to set up your contact details, preferences about how the alarm is triggered, a description (and even a picture) of the bike it's attached to if you wish, things like that. You can also launch the tracking screen, which shows where your bike is right now. You can also launch a history that shows where you've been, when...and how fast you were going. Which is cool. It's also handy that the data isn't downloadable directly from the unit, only from your tracking portal, and that the system isn't obvious on the bike. Both of which mean that it's extremely unlikely the data would or could be used as evidence against you. Anyway, back to the test. Very simple. I parked at a convenient location nearby, turned the bike off, went for a cuppa to give it time to settle down (I don't know if that's necessary or not, but it seemed like a good idea) and then proceeded to steal my bike. By the time I'd pushed it 15m or so my phone was buzzing. 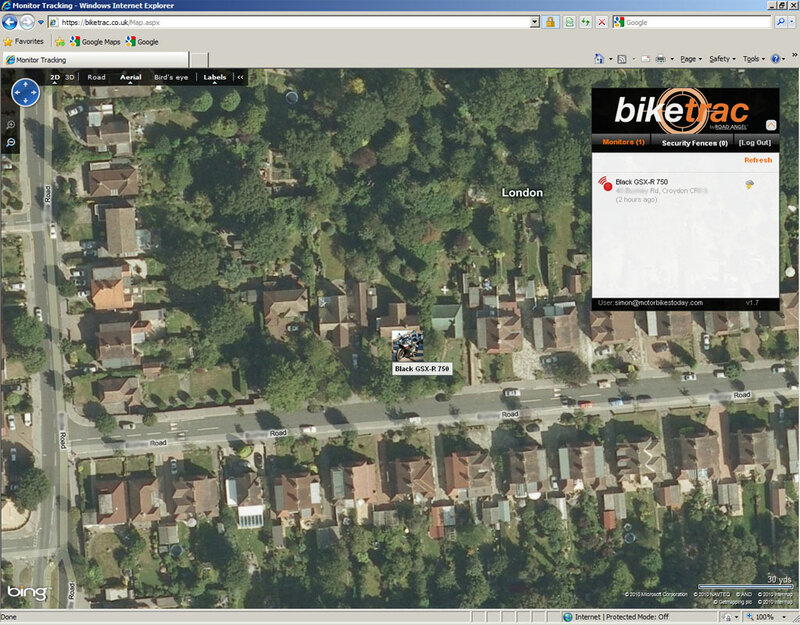 The system texted me with the address, partial postcode and time, and advised me that my bike was being moved. To say I was impressed is an understatement. I was gobsmacked at how accurate and how fast Bike Trac actually is. Bike Trac isn't especially expensive at £299 for the unit, though the £100 a year (or £180 for 2 years) additional subscription means that it isn't especially cheap either. But when you look at the aggravation of having your bike nicked, and the potential to not only get it back but get the thieves collared as well, it's money well spent. Plus, of course, most insurance companies will give a reasonable discount that should contribute to the cost. Simple sum-up here. Bike Trac works, it's cost effective and it makes life harder for the low-lifes who steal our motorbikes. I'd seriously recommend it as something nobody should be without.